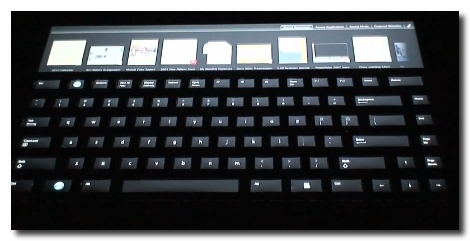 Looks like Microsoft has come up with a pretty slick little keyboard. It’s very much like the Optimus, which has an OLED screen in every key, except that it doesn’t have a screen in every key. Instead there’s just one screen on the whole unit and they keys have been overlayed on top while allowing the image to show through. Brilliant really, since this should drastically reduce the $2400 price tag of the original. That is, if you could buy the device. Microsoft’s not selling this hardware (yet anyway), but offering it up as test hardware for the UIST Innovation Contest. It will be interesting to see what the students come up with. This keyboard should be easier to program for since it involves manipulating just one screen. There is also extra space at the top that is touch-sensitive. See for yourself after the break.